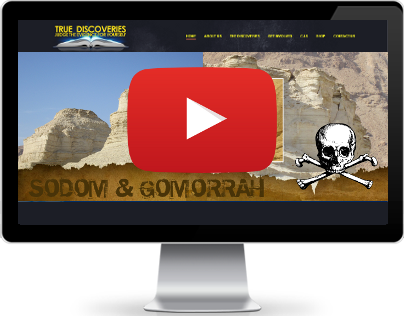 1) Why did God destroy Sodom & Gomorrah? Most people associate Sodom & Gomorrah with only one sinful passion – that of sexual perversion. And they were guilty of that, as are a large number of people not only today, but down through the ages. But the Bible states that their sin was more than that: “Behold, THIS was the iniquity of thy sister Sodom, PRIDE, FULNESS OF BREAD, and ABUNDANCE OF IDLENESS was in her and in her daughters, NEITHER DID SHE STRENGTHEN THE HAND OF THE POOR AND NEEDY. And they were HAUGHTY, and COMMITTED ABOMINATION before me: therefore I took them away as I saw good” (Ezekiel 16:49, 50). In the above passage, we learn that the root of their sinfulness stemmed from their great wealth which led them to idleness and a disregard for those less fortunate than they. They were full of pride and haughtiness, thinking they were better than others. Why were they so wealthy? The mention of the “slime pits” may provide the answer for it was a most valuable commodity in those days, being used extensively all over the ancient world. Not only was it used as a coating for burnt mud bricks (as a preservative), it was used in the mortar; it was used to provide a water-tight covering for things such as the “reed ark” Moses was placed in as a baby. Even today, according to the Encyclopedia Britannica, “In its various forms bitumen is one of the most widely distributed of substances”. In the Ebla tablets, one tablet listing some purchases and the price for each item in silver, shows that the highest price was paid for bitumen. And the people of these cities had only to walk out in their “front yard” and gather it. They had no reason to engage in hard work. They had a “gold mine” just there for the taking. This also explains why the kings of the great nations wanted to make them vassals – to participate in their great wealth through the extraction of tribute in the form of bitumen. This bitumen could also possibly have provided a hint as to a catalyst in the conflagration which occurred in this plain. Bitumen, or slime pits, results from an underground petroleum reserve oozing through to the surface. And all oil reserves have natural gas associated with them, which also can seep into the air. All of this is speculation, but the region yields the elements and evidences of an extremely cataclysmic occurrence – one in which a lake was formed, blocking the river from its continued flow and which devastated the entire plain to the extent that nothing grows there. This is the deepest spot on earth. It dips down between Israel and Jordan, some 1,300 feet (400 meters) below sea level, to what is known as the DEAD SEA. In this lake no fish can live. The waters are 28 per cent salt, six times saltier than the ocean. Any careless fish that ventures from the River Jordan down into this evil lake chokes to death and is pickled. 2) The Bible indicates that the area was fertile, according to Genesis 13:10. Where is the evidence of this? Today, the dead sea region is like a lunar landscape – dry and forbidding. How can one ever believe the Bible depiction of the area as a well-watered, fertile land that could sustain giant herds of cattle; that was watered by five rivers supporting five cities, and where a pair of Bedouin stockmen (Lot & Abraham) became rich inside of a generation? It is naive to imagine that the climate of Palestine has remained unchanged over thousands of years. There is much evidence that prior to 1000 BC, large forest trees covered especially the higher elevations. This would have resulted in a much greater rainfall than exists today. Grasslands in the Jordan area would have supported a wide range of domesticated animals. There is also much evidence that the land supported a wild animal population that is not unlike that of North Africa. Elephant herds even roamed Northern Syria. The demand for tusks was so great that they became extinct by the eighth century BC. As a result of deforestation, by 1000 BC the climate had changed dramatically. Evidence of the lushness of the region can be seen from the cemetery at the ruins of Bab edh Dhra and neighboring sites to the southeast of the Dead Sea. They all had very large cemeteries, containing tens of thousands of burials. These people all depended on the fertility of the surrounding countryside. Examination of skeletal remains indicates that they were robust, healthy people. From study of remains at Bab edh Dhra we know that the people were growing and harvesting wheat, barley, grapes, olives, figs, lentils, chickpeas, flax, pistachio, almond and assorted wild plants. There is strong evidence that irrigated agriculture was practiced. In analyzing the sediment core from the Sea of Galilee, researchers “found that the 018isotope was depleted in the deposits… (from) around 2000 years BCE. Such depletion reflects colder, therefore wetter, climate conditions. ” (A.S. Issar and D. Yakir, “The Roman Period’s Colder Climate “, Biblical Archaeologist, Vol. 60, No. 2, June 1997, p.104; also M. Stiller, “The Late Holocene Sediments of Lake Kinneret (Israel): Multidisciplinary Study of a 5m Core,” Geological Survey of Israel, Ministry of Energy, Jerusalem, 1984). The resulting raining of fire and brimstone (sulfur), in which the land was “smoking like a furnace”, utterly destroyed the cities and turned the countryside into desert, which we see as today. (Genesis 19:25). Indeed, the biblical account has the ring of authenticity. 3) Are not the ruins under the deep waters of the dead sea? In 1960, an American explorer, with the friendly cooperation of the Jordanian monarchy, attempted to make a search of the north, middle and south end of the Dead Sea bottom. He located, photographed and displayed a few poorly identifiable objects that he claimed to have found at depths and locations that are INCOMPATIBLE with the actual depths in the named locations. The only certainties that emerged were that there were once trees growing on the land now covered by water. And there was no evidence of any remains of cities. But these efforts and published data have led many to incorrectly believe that the cities rest beneath the Dead Sea. The Apostle Peter, writing in the first century, says: “And turning the cities of Sodom and Gomorrah into ashes condemned them with an overthrow, MAKING THEM AN ENSAMPLE unto those that after should live ungodly” (2nd Peter. 2:6). “Even as Sodom and Gomorrah, and the cities about them in like manner, giving themselves over to fornication, and going after strange flesh, are set forth for an example, suffering the vengeance of eternal fire” (Jude 7). 1. The ruins were VISIBLE IN HIS DAY – ON THE BORDERS OF THE DEAD SEA, not hidden under it! 2. The bitumen pits (of the old Vale of Siddim) were SUBMERGED – but NOT THE RUINS OF THE CITIES. 3. His description of the remains perfectly describes what can be seen in these five ashen sites. They are all whitish in color; the shadows and shapes display all the visual characteristics of ancient cities and walls. 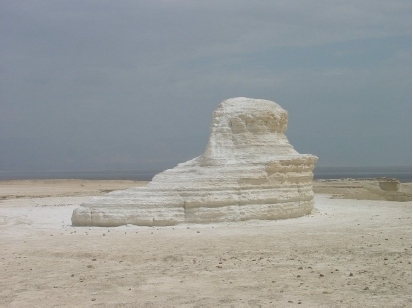 THE ASHEN REMAINS are still A VISIBLE EXAMPLE, AT THE EDGE OF THE DEAD SEA. The Bible said they were turned “into ashes” (2nd Peter 2:6). And that is what’s seen. 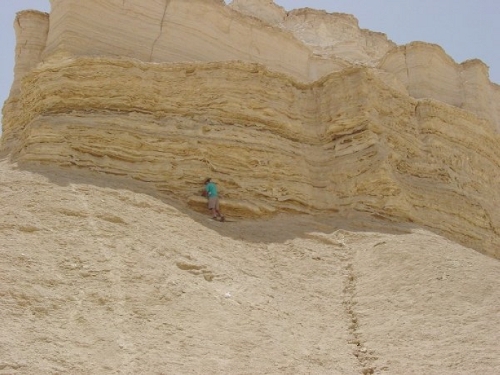 From surveying, mapping and dating the ancient shore lines in the salt caves of Mount Sedom (Mount Sodom), Hebrew University speleologist Amos Franklin concluded that the sea level about 2,000 years ago was higher than at present. 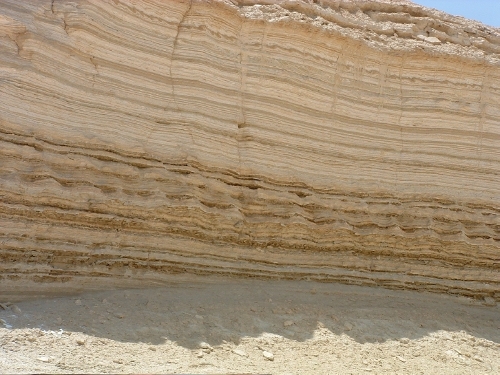 (A. Frumkin, Holocene Environmental Change Determined from Salt Caves of Mount Sedom, Israel. The Holocene, 1, 1991. pp.191200). 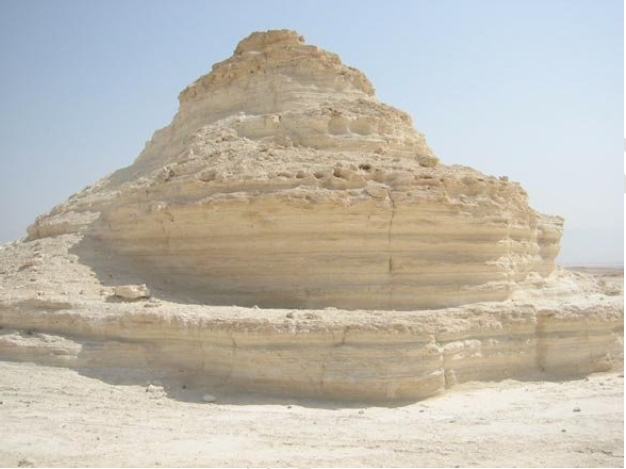 If the remains of Sodom and Gomorrah were VISIBLE in the first century (when the sea level was higher), then the same remains CANNOT BE UNDERWATER TODAY, when the sea level is lower. 4) But doesn’t the Bible say that Sodom & Gomorrah and the other cities were in the Vale of Siddim, which is now the dead sea? Proof: “These made war with Bera king of Sodom, and with Birsha king of Gomorrah, Shinab king of Adman, and Shemeber king of Zeboim, and the king of Bela, which is Zoar. ALL THESE WERE JOINED TOGETHER IN THE VALE OF SIDDIM, which is the salt sea” (Genesis 14:2,3). The text does NOT say that the CITIES were joined together in the vale of Siddim. But it says they joined in battle in the Vale of Siddim. Let’s read the whole passage: “And it came to pass in the days of Amraphel king of Shinar, Arioch king of Ellasar, Chedorlaomer king Elam, and Tidal king of nations; That these made war with Bera king of Sodom, and with Birsha king of Gomorrah, Shinab king of Adman, and Shemeber king of Zeboim, and the king of Bela, which is Zoar. All these were joined together in the vale of Siddim, which is the salt sea” (Genesis 14:1-3). According to this whole passage, it is the two opposing confederacies of kings that fought in battle in the Vale of Siddim. VERIFICATION: verse 8: “And there WENT OUT the king of Sodom, and the king of Gomorrah, and the king of Adman, and the king of Zeboim, and the king of Bela (the same is Zoar); and THEY JOINED BATTLE WITH THEM [the invaders] IN THE VALE OF SIDDIM. “ The cities of Sodom and Gomorrah were ON THE PLAIN OF JORDAN (Genesis 13:10-12). Thus they were called “cities of the plain”. Genesis 14:8 says the kings of Sodom and Gomorrah WENT OUT of their cities, to go into the Vale of Siddim. They had to GO OUT of their cities to get into the valley. The cities themselves were not physically in the valley – but the battle was! 5) Could the ruins be under the water of the drowned plain to the south of the dead sea? The Jordan River flows into the Dead Sea, but there is no outflow from the sea. Thus, over the ages, the level of the sea had risen to cover the flat plain to the south, and scholars hopefully suggested that the cities lay beneath these shallow waters. More recently, however, the Jordan waters have been siphoned off for irrigation purposes. This lowered the lake level and largely exposed the southern plain, but there was no sign of any ruined cities there. 6) Some people say that the remains of Numeria and Bab Edh Dhra on the east side of the dead sea are the actual sites of Sodom & Gomorrah. Is this true? The second reason that these sites don’t qualify as candidates for the cities of the plain is their size – the largest site, Bab ed-Dra is just 10 acres, while Numeira is only 2! Think about it- that’s not large enough to even qualify as SMALL towns. The evidence shows that these sites were indeed high places, or places visited by pilgrims. The cemetery at Bab ed-Dra is said to contain over 20,000 graves which hold over 500,000 people. Could that many people live in a 10 acre town? Of course not. But the possibility that they were high places and cemeteries of the cities of the plain is a possibility, in our opinion. With the cities completely destroyed, perhaps God allowed their cemeteries and high places to remain as a testimony of the fact that an extremely large population once lived in the area. Thirdly, Peter mentions the condition of the remains of Sodom and Gomorrah during the time of Christ: “And turning the cities of Sodom and Gomorrah into ashes condemned them with an overthrow, making them an ensample unto those that after should live ungodly” (2nd Peter 2:6). This verse is full of information – for one thing, it tells us that the cities were ASHES. That may seem like a logical conclusion since they were destroyed by fire. However the adherents to the theory of the five sites on the Jordanian side of the Dead Sea (Bah edh Dhra, Numeira, etc) have failed to note that these are NOT ashen. These sites show evidence of being burned; archaeologists unearthed a thick layer of black ash. But the sites are NOT ash, as the Bible tells us Sodom and Gomorrah were. They contain a large number of burnt artifacts but they also contain foodstuffs (including carbonized grapes which still have their skins) and other articles that are still intact. Careful examination of the remains of these cities shows them to be typical of those destroyed in war. Archaeologists have found wood and other flammable materials in VARYING STAGES OF DECAY, and this is not compatible with the destruction of the “cities of the plain” as described in the Bible! There is no evidence whatever that sulfur (brimstone) was involved in their overthrow! There is no evidence of fire from the heavens. Fourthly, the land east of the Dead Sea was anciently known as Moab, Ammon or Seir (Edom). Deuteronomy 2:8-12 states that the traditional inhabitants of Moab were Emims, and those inhabiting Seir were a group called Horims, who were later dispossessed by the descendants of Esau. Thus the lands bordering the east side of the Dead Sea were not Canaanite. Now the `Cities of the Plain’ were unquestionably Canaanite cities, since they are listed to define the borders of Canaanite territory (Genesis. 10:19). 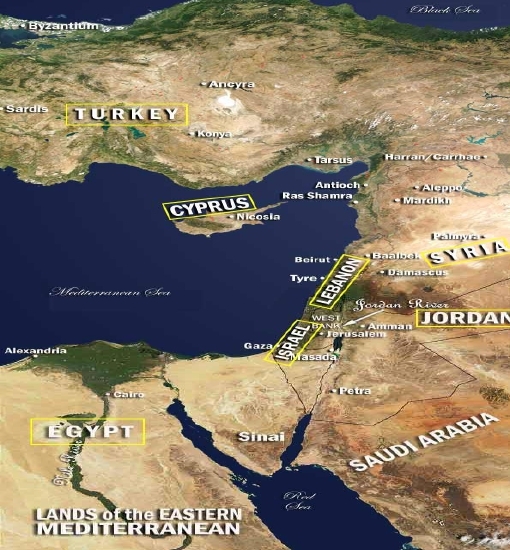 The Canaanite territory was to the west of the Dead Sea. 7) Were not the cities all grouped together, as some scholars have noted? According to your findings the cities are spread far apart! Yes, the ashen sites have been found scattered over a distance of 50 or more miles (80+ kilometers). However, it is the location of Zeboim that we found the most incredible. It was several miles above the northern end of the Dead Sea, past Jericho. This scenario certainly “bucks” the establishment’s theories. We are placing these cities from one end of the Dead Sea to the other, and beyond. “And the border of the Canaanites was from SIDON, as thou comest to GERAR, unto GAZA; as thou goest, unto SODOM, and GOMORRAH, and ADMAH and ZEBOIM, even unto LASHA ” (Genesis 10:19). The location of Sidon, Gerar and Gaza are well established. From Sidon, the most northerly point along the coast of Palestine, Gerar and Gaza are situated progressively southward. From Gaza to Sodom, the border turns eastward. One can reasonably expect the remaining cities to be similarly spaced geographically, since they are mentioned merely to delimit the extent of Canaanite occupation. 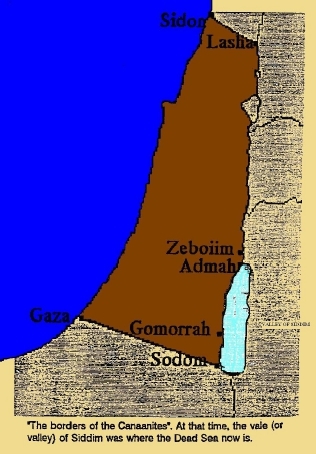 In viewing a map, it seemed strange that Sodom, Gomorrah, Admah and Zeboim would each separately be listed if they were all in the same general location, at the south end of the Dead Sea. Had such a close grouping been the case it would have been sufficient to mention only one of the cities, probably the largest. Since Zoar was in close proximity to Sodom and a much smaller city, its mention is unnecessary and it has thus been omitted from the list. Thus one would expect to find the `Cities of the Plain’ located at intervals along the boundary of Canaan, beginning with Sodom and progressing to Gomorrah, thence to Admah, and finally Zeboim, further along the boundary of Canaan. Genesis 10:19 seems to best support a geographically spaced distribution for Sodom, Gomorrah, Admah and Zeboim, rather than a close geographical grouping. “And Saul, and Jonathan his son, and the people that were present with them, abode in Gibeah of Benjamin: but THE PHILISTINES ENCAMPED IN MICHMASH. And the spoilers came out of the camp of the Philistines in three companies: one company turned unto the way that leadeth to Ophrah, unto the land of Shaul: And another company turned the way to Bethhoron: and ANOTHER COMPANY TURNED TO THE WAY OF THE BORDER THAT LOOKETH TO THE VALLEY OF ZEBOIM TOWARDS THE WILDERNESS” 1st Samuel 13:16-18. Examining a map, you can see that this description of the Philistines coming out of Michmash had one company going north, one going west, and the last one heading directly east – and the one heading east to the Valley called “Zeboim” was heading to the same place that Ron found the last site! It made perfect sense that the name of the city was preserved throughout the years even though the city was long ago destroyed, just as Mt. Sodom even today still bears the name “Sodom”. Israel had displaced the Canaanites – Zeboim was a border city of Canaan, and now its ashen remains were a border of Israel. Hosea (11:8) mentions Admah and Zeboim in association with Ephraim. While they are here used to exemplify the type and magnitude of destruction which God is reticent to bring upon Ephraim, the more common use of Sodom and Gomorrah in reference to this destructive event could have served just as well, unless a further reason exists for their use. It seems likely that the use of Admah and Zeboim was favored due to a geographical association. The boundaries of Ephraim are defined in Joshua Chapters 16-17. Ephraim’s lower boundary shows points of confluence with the plain of the Jordan where it runs from the Jordan and Jericho inland to Bethel. This would suggest that Admah and Zeboim were located in the northern Jordan region. Their joint mention seems to indicate both their proximity to each other and to the southeastern border of Ephraim. “And Abram …went … to Bethel, … between Bethel and Hai; unto the place of the altar, which he had made there at the first: and there Abram called on the name of the LORD… “ (Genesis. 13:2-4). “…Lot LIFTED UP HIS EYES, AND BEHELD ALL THE PLAIN OF JORDAN, that it was well watered every where, before the LORD destroyed Sodom and Gomorrah, even as the garden of the LORD, like the land of Egypt, as thou comest unto Zoar. Then LOT CHOSE him all THE PLAIN OF JORDAN,’ and Lot JOURNEYED EAST.’ and they separated themselves the one from the other. Abram dwelled in the land of Canaan, and LOT DWELLED IN THE CITIES OF THE PLAIN, and PITCHED HIS TENT TOWARD SODOM” (v. 10-12). While standing in the region of Bethel, obviously high on a hilltop, Lot looked and saw the Jordan Valley. Now this is quite a distance away, and because of the mountains, only the northern end of this valley could be seen – certainly not as far south as Sodom or Gomorrah. One author in the late 1800s checked this out for himself, and this is what he wrote: “… what can there be seen is the Northern end of the Dead Sea, the Jordan Valley, and the river running like a blue thread through the green plain. The hills of Engedi shut out completely all view of the southern end of the sea; but as I before said, the northern end, where the Jordan runs in, and about two or three miles of the sea, can be seen. I have wandered all over the Bethel hills and tested this question. ” (The Bible and Modern Discoveries, by Henry A. Harper, a Member of the Palestine Exploration Fund Society, 1891). What this means is that the area Lot saw WAS the northern end of the area now occupied by the Dead Sea. When he travelled EAST, this is where he journeyed to. And then, it said he “dwelled in the cities of the plain”, which is not a specific designation, and then that he “pitched his tent towards Sodom”, or went in that direction. We later learn that he took up residence in that city. So, the biblical account shows that the “Plain of Jordan” did indeed cover a large area since the northern region is what caught Lot’s eye. Then, it describes Lot “dwelling” in the “cities of the plain” and then pitching his tent “toward Sodom”. Perhaps this is describing Lot’s travels, with him first staying in other cities and finally continuing on in the direction of Sodom, where we know he finally settled. We must remember that Lot had a tremendous amount of animals because the whole reason he separated from Abraham was because their combined flocks were too much for the land around Bethel. So, as Lot journeyed through the plain, he had to travel slowly, taking his flocks with him. Wherever he stopped along the way, he had to have enough pasture land for the animals. And when he finally settled in Sodom, he still had to have pasture land for his flocks. This indicates that there was pasture land near the city. The sites Ron located are all several miles apart, with plenty of land between them. 8) Doesn’t the Bible speak of only TWO cities that were destroyed? Why do you say that FIVE were destroyed? Hosea mentions the fate of “Admah…Zeboim” Hosea 11:8. Deuteronomy speaks of the overthrow of “Sodom, and Gomorrah, Admah and Zeboim” Deuteronomy 29:23. 9) When you say you have found the remains of Zoar, which is also turned to ash, doesn’t this contradict the Bible account which says that Lot & his family fled from the burning of Sodom to a safe refuge at Zoar? Zoar was not destroyed at precisely the same time as Sodom and Gomorrah. Again, we find the answer in the biblical account. “And Lot went up out of Zoar, and dwelt in the mountain, and his two daughters with him; for HE FEARED TO DWELL IN ZOAR: and he dwelt in a cave, he and his two daughters. And the firstborn said unto the younger, our father is old, and THERE IS NOT A MAN IN THE EARTH to come in unto us after the manner of all the earth. Come, let us make our father drink wine, and we will lie with him, that we may preserve seed of our father” Genesis 19:30-32. For some reason, Lot became afraid to continue to stay in Zoar, so he and his daughters left. The next thing we read is that they dwelt in a cave and his two daughters state that there are no men left “in the earth” to “come in unto us after the manner of all the earth”, or in short, to make them pregnant. This tells us that for some reason, shortly after leaving Zoar, they believe they are the only people left on earth. Why would they think this unless they had just witnessed the destruction of Zoar? The area of land that had been affected by the conflagration which destroyed Sodom and Gomorrah was extremely large, and to Lot and his daughters, it probably looked as if the entire world had been destroyed, except for little Zoar. Then, as they dwelled in Zoar and witnessed the fact that its inhabitants were just as wicked as those of Sodom, they expected it’s soon destruction, which is exactly what occurred. Whether this happened the next day, or week or month, we have no way of knowing. That Zoar was finally reduced to ashes in the same manner as the other four cities is seen in the remains of the 5 sites – all identically reduced to ash, and all 5 with balls of brimstone laid throughout the ash. There is no other way these physical remains can be explained. The fifth site we have found is extremely small, compared to the other four, and it is in a perfect square. Isthis Zoar? 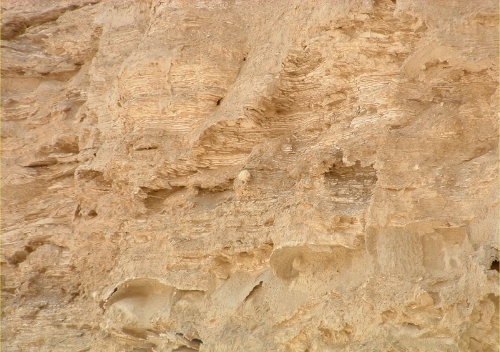 (a) Zoar was close to Sodom (Genesis 19:20) – as are these ruins. (b) It is identical in condition to the other four sites. (c) It is the smallest of the 5 sites (compare with Genesis19:20 – “a little one” – and in Genesis 14:2,8 it is listed last, implying its inferiority). (d) It was also close to the mountains (to which Lot finally fled). Lot dwelt but a short time in Zoar. Iniquity prevailed there as in Sodom, and he feared to remain, lest the city should be destroyed. Not long after, Zoar was consumed, as God had purposed. 10) How can you say that Zoar was destroyed, when it was mentioned as a place long after the destruction of the cities of the plain? Just as Zoar is mentioned as a place name subsequent to the destruction of the cities of the plain, so is Zeboim (one of the five cities of the plain). In 1st Samuel 13:18 the name survives as a location in the time of the Philistines, and in Nehemiah 11:34 Zeboim is again mentioned as one of the habitations of the children of Benjamin after the Babylonian captivity. It was customary for names to linger in the same locality even though a city might no longer exist there. 11) Are not the remains of the cities nothing more than deposits formed when the dead sea had once covered the entire area? Firstly, several labs have tested the whitish material and told us it is ash. Secondly, the Dead Sea is composed largely of potassium chloride. 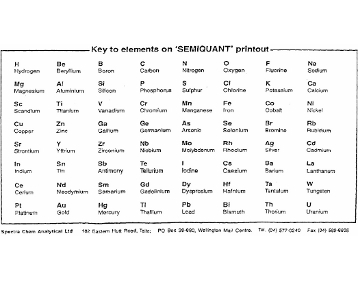 Potassium is not present in the ash samples. 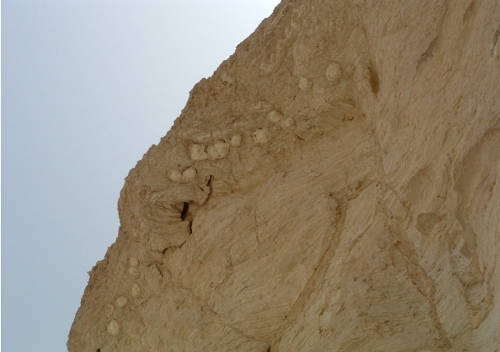 Thirdly, if the whole plain area between the Dead Sea and the mountains had once been underwater, then these formations would be evenly distributed over the entire area that had been covered. But they are not. They are isolated. 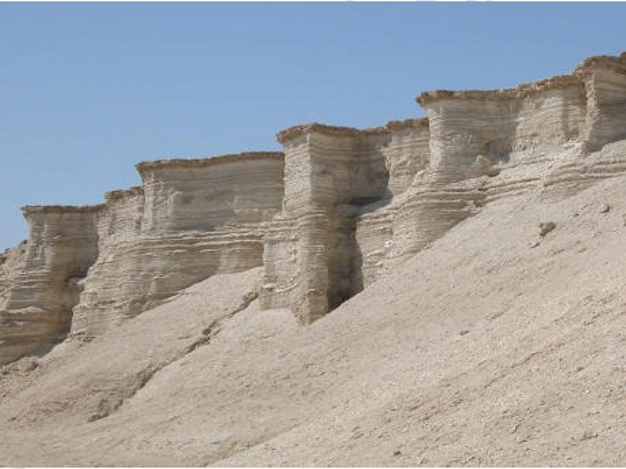 12) Are the city remains just a geological formation formed by erosion? Well, consider Gomorrah, the best preserved site. There are symmetrical raised platform areas inside the city running from north to south in length, whereas the erosion from water run-off from the mountains to the west runs west to east. The pictures and video evidence all show man-made structures. The “streets” in Gomorrah were constructed to communicate with each other like streets. If these had only been gullies from the flash floods, they would have washed down from the mountainside in a random pattern. There is also evidence of ‘double-walls’ construction with the 90 degree angles. Indicative of being man-made. Also consider the distinct shapes of pyramids and sphinxs and temple columns, all show that these were man-made structures. There is no doubt that all of these features-and these are just a few of many -are simply beyond the realm of simple coincidence. These sites were not formed by erosion. 13) Could the destruction of Sodom & Gomorrah have been caused by a volcanic eruption? There is a distinct difference between the sites of Sodom and Gomorrah and any other sites on earth -even those destroyed by volcanic eruptions. Firstly, they are TOTALLY turned to ash -people, included. TOTALLY. Compare this with Pompeii, a city destroyed by the eruption of Vesuvius; here you see ash covering over a city. The ash came down and smothered everything. The buildings were dug out from under that ash – but they were still stone. On the walls of some of these stone buildings you could still see murals. But in Sodom and Gomorrah, everything was turned to ash. The ash is not covering the cities. The cities themselves are ash – buildings, artifacts, everything. Secondly, lying through the ash are balls of pressed-powder sulfur in shells (capsules), surrounded by burn rings. We have not been able to find these anywhere else on earth. We are not aware of a scientific explanation for these. 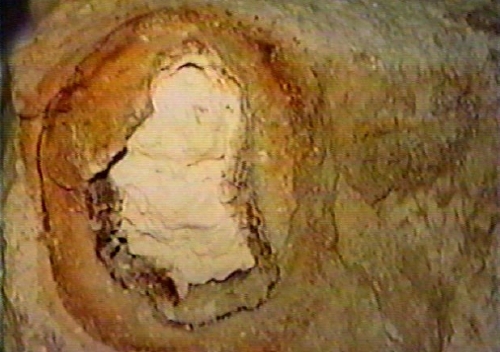 The uniqueness of this type of sulfur ball, surrounded by burn rings embedded in ash, tells us that the event occurred exactly as the Bible says. 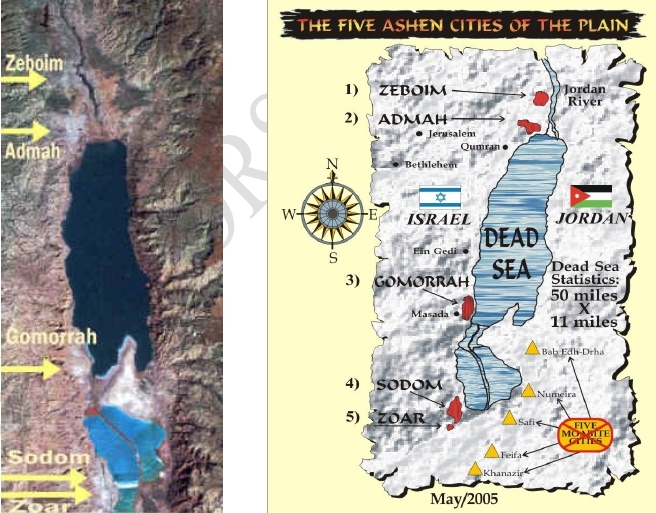 14) If these five cities have all turned to ash, how could the remains have been able to survive more than 3900 years? The destruction of these cities took place approximately 3,900 years ago, so it is quite amazing to find ANY remains of ashen heaps. That they were destroyed in a Divine manner is understood, but it appears that they were also preserved in a Divine manner. These are not composed of the kind of ash we commonly think of, that blows away into the wind. 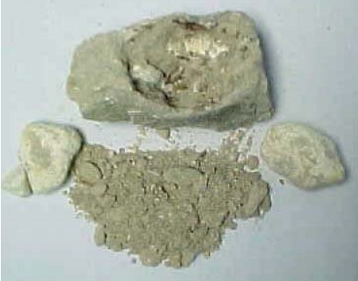 It is compacted ash – the material is densely-packed and crusty on the outside. But when broken open, the substance is much softer, and with continual crushing, is soon reduced to powder. The French scientist, Lavoissier, when studying the nature of combustion (a chemical process), discovered that substances burned with sulfur (brimstone) had a remaining ash that was HEAVIER than the original, unburned substance. Further study into combustion gets extremely complicated – much too much to get into here – but indicates that the event of the destruction of these cities was the result of a carefully controlled chemical reaction that took place VERY rapidly, yet maintained an equilibrium that didn’t result in an explosion. 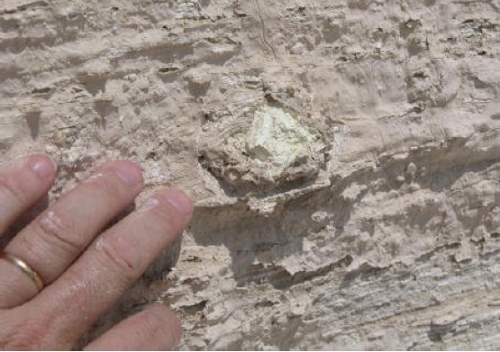 15) Isn’t it true that sulfur balls (brimstone) have been found in other places along the Jordan valley? “And he overthrew those cities, and all the plain, and all the inhabitants of the cities, and that which grew upon the ground” Genesis 19:25. Anyway, influenced by the common misconception that the cities were at the southern end, these men obviously were on the very sites, yet misinterpreted them as being “marl”, or an earthy limestone deposit used as fertilizer on soils deficient in limestone. 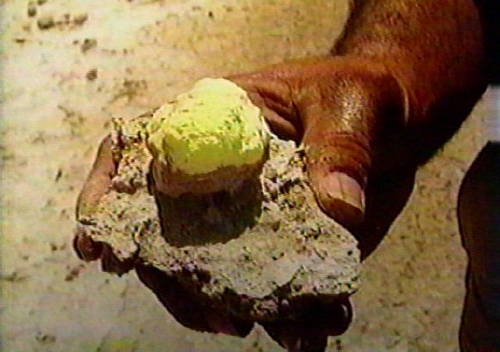 16) How big are these sulfur balls (brimstone) ? These nodules vary in size – most are small, ranging from the size of a thumbnail to that of a GOLFBALL, others are large chunks that weigh several kilograms! 17) Have you had Laboratory tests done on the sulfur (brimstone)? A test performed on a sample given by Jonathan Gray to Ross Patterson in New Zealand was taken to Spectrachem Analytical Ltd of Wellington. 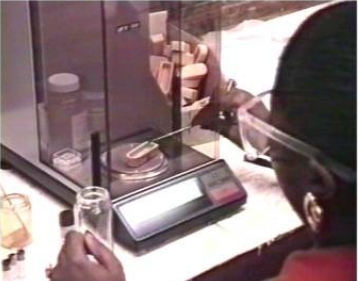 The test by x-ray fluorescence analysis was performed on October 25, 1994, and showed that the specimen was 98.4 per cent sulfur. Other tests have been conducted in the U.S.A. and in Britain. 18) Has the Lot’s wife “pillar of salt” been found? Lot and his family fled from Sodom to the small city of Zoar, just a few miles away. In between the two places was a segment of Mount Sodom and this fits the picture from the Genesis account perfectly. When Lot’s wife tarried long enough to look back, she was turned into a pillar of salt, which indicated that there was another process which also took place at that time. This process, whatever it was, converted a particular area into salt, and it appeared that Lot’s wife got caught up in that. When tourist buses go down into the Sodom area, a guide may point out one of the numerous salt pillars and say, “That’s Lot’s wife.” The truth is, no one knows whether the pillar of Lot’s wife has even survived let alone which one it would be. 19) Do any Israelis know of this discovery? Some local tour companies now take visitors to the site of Gomorrah. Tourists are reportedly excited to see the remains and to pick up sulfur balls. 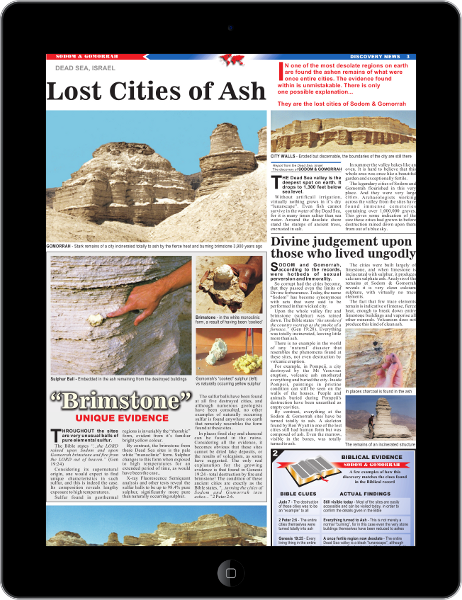 20) The Christian organization “Answers in Genesis” or “Creation science” writes that one of your supporters sent them two samples of ash from the alleged site of Sodom & Gomorrah. But when they sent them to a reputable lab, they turned out to be “an evaporate deposit of gypsum-type minerals (NOT ASH); including an abundance of carbonates, which would be broken down by heat.” Is this true? IMPORTANT NOTE: For those who do not know who Answers in Genesis are, they are a Christian group who’s mission is to verify & defend the word of God, in particular the creation account as outlined in the book of Genesis. This group has done a wonderful job in defending & proving the Genesis account as outlined in the Bible. They produce excellent materials and are a source of help to many Christians. Sadly, SOME of the people who work for this organization, under a false pretense of being humble and having integrity, have set themselves up as the standard of ‘Truth’ for what constitutes real evidence and are led by worldly wisdom, pride & their own agendas. As we see the weight of evidence accumulating, to keep opposing it requires an extra measure of foolishness. But trying to pin a man down to FACTS can be futile. It becomes easier to understand the Lord Jesus Christ’s anger at the Pharisees of His day who thrived on debating the trivial things. It was not that they could not understand Him, but that they would not. Despite the over-whelming evidence showing who He was! We appeal to some of these people who are working for these organizations to go to the sites for yourselves & stop (un)knowingly deceiving people.  We appeal to all people…..judge the evidence for yourselves! Please do not allow any religious teachers or scientist, to tell you what to think or to believe. Weigh-up the evidence for yourself!!! This is ESSENTIAL!!! Anyway back to the question. The writer adds that “lab testing of alleged `ash’ samples definitely confirms that these are not `burnt buildings’.”So could you be wrong about your sites being ash? Here are the two analysis; they differ in composition. Well, what DID the lab testing show? We did our own investigation. Note that a lab analysis does NOT define whether a sample is ash or not. Furthermore, contrary to “Answers in Genesis” (“Creation Science”)’s allegation, a lab analysis DOES NOT confirm whether remains are `burnt buildings’ or not. It does no more than list ten minerals tested for. Now, the critic made a big fuss over the fact that a large proportion of one sample was GYPSUM… The critic’s verdict: “not burnt buildings”. Limestone + sulfur + great heat = GYPSUM (calcium sulfate). (Crystalline limestone is marble. Add great heat and you have “burnt marble”.) There are many other reactions as well, but that is the important one. Note that gypsum has long been quarried for building (for example, as modern “gyp-board”). 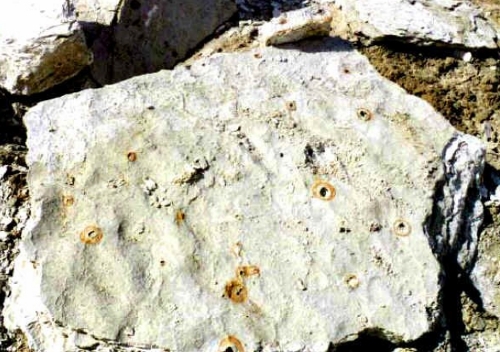 Also, the presence of sulfur balls inside burn skins (capsules) surrounded by vitrification rings lying all over the sites is clear evidence that the sites were incinerated. Again, we have had a number of our samples tested – and they are ash. Ron Wyatt took samples to Galbraith Labs near Knoxville. A sulfur ball was found to be 95.72% sulfur, with traces of several other elements, all of which, he was told would contribute to an extremely high temperature fire. Once again, the material around it was ASH. At the sites, even the ground dirt has been turned to ASH right down to the bedrock.